How Quickly is Video on Mobile Growing? Increasingly, video is consumed on smartphones and tablets. Ooyala estimates that 62% of video plays come from mobile devices in 2018 Q2. This is double the share from 2014. Smartphones alone account for almost 50%. For filmmakers, websites, and apps, it’s important to understand how people consume video, particularly on smartphones. How Does Device and Screen Size Impact Device Orientation? In past Mobile Overview Reports (MOVR), we here at ScientiaMobile analyzed how devices are typically held – either in portrait or landscape orientation. We also analyzed whether orientation varied from smartphones vs. tablets, screen size, and operating system. Given video’s importance, we decided to revisit the analysis and look specifically at video. Do people change their orientation on smartphones when they watch, or expect to watch, video? How Frequently Do Video Viewers Hold Smartphones in Portrait Orientation? In our 2018 Q4 MOVR, we analyzed 3.9 million webpage visits to study this topic. 25% of these visits originated from video-centric websites. To isolate the impact of video on a user’s device orientation, we applied a restriction that more than 90% of the content on the page needed to be in the form of videos. For example, online news outlets that had videos interspersed with their text reporting did not qualify as video centric. And we only measured websites, not apps (e.g. we did not study Netflix), that are known for streaming video. This restriction narrowed the video-centric websites down to adult video (75% of domains measured) and viral video content (25% of domains measured). We measured the device orientation upon the initial page load and once again if they changed their orientation. This two-step measurement means that the user had the opportunity to adjust (or maintain) orientation based on his/her knowledge of the content of the site and whether video is available. If the user changed orientation, then we classified the orientation according to its final state (more analysis of the changes is below). 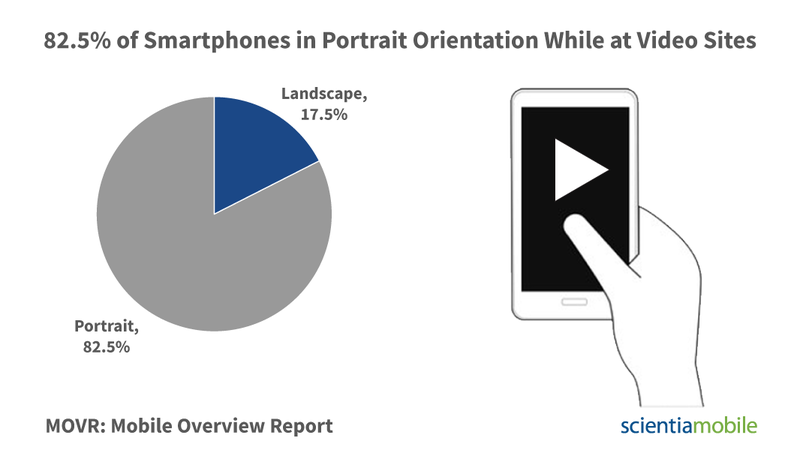 Of the smartphone users, 82.5% hold their phones in portrait orientation when on a video site. Or conversely, 17.5% are held in landscape orientation when on a video site. 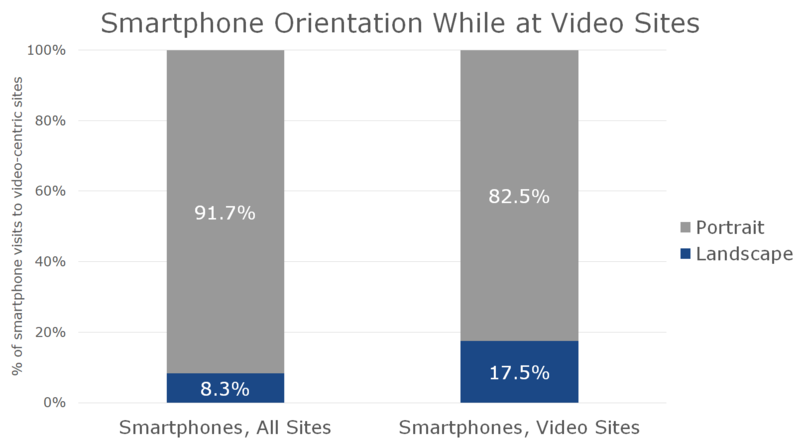 When comparing non-video sites to video sites, smartphone users are in landscape orientation an additional 9.2% when on video sites. Given that most video is shot and intended for consumption in a landscape mode, this preference to stay in portrait is surprising. The result implies that the smartphone’s form factor overrides the video’s intended or optimal consumption orientation. Why Do Users Watch Videos In Portrait If It’s Not A Great Experience? The fact that 82.5% of smartphone users view videos while holding the phone in portrait orientation is surprising. It’s not an optimal viewer experience. 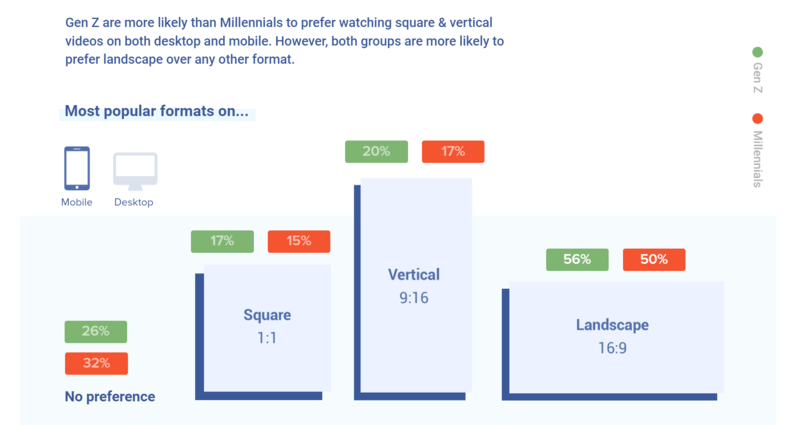 Likewise, a study from Wibbitz show that 50% of Millennials state that their “preferred format” is landscape. This discrepancy between surveyed preferences and actual measured behavior is an interesting issue, but what interviewees say and what they do is not always aligned. And video format is not the same as device orientation. 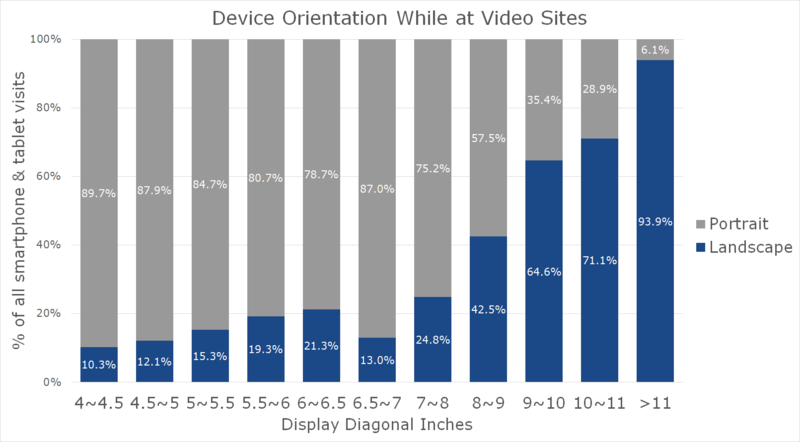 People may prefer the 16:9 shape of the landscape video format, but they may not bother to align the device orientation to achieve the optimal experience. Smartphone users sometimes lock their orientation to portrait. In fact, several manufacturers ship with smartphones locked in portrait. Learning how to unlock orientation is a technical hurdle for many users. The increasing size of smartphone screens makes the video acceptably large enough to view in portrait. The content of much video on the internet is not so compelling that it requires an expansive landscape experience. For example, many users use videos to play music, news reporting, or other entertainment that does not require full immersion in the visual elements. Landscape orientation requires a shift in form factor from a one-handed to a two-handed experience for many people. Or at least a one-handed landscape grip is not common for most people. Avoiding this inconvenience (remaining in portrait orientation) for a user may override the penalty of a diminished video experience. Streaming services make it easier for smartphones to remain in portrait mode while casting the video to a larger display device, e.g. a Smart TV. If users will not change their orientation behavior, then how should video producers respond to deliver a more optimal experience? Changing video formats to portrait or square might address this audience’s needs. This would alter video and filmmakers “landscape-first” practices. The debate is underway right now about whether or how to change. How Frequently Do People Flip Their Smartphone From Portrait to Landscape Orientation? Our methodology monitored whether viewers flipped their phones. 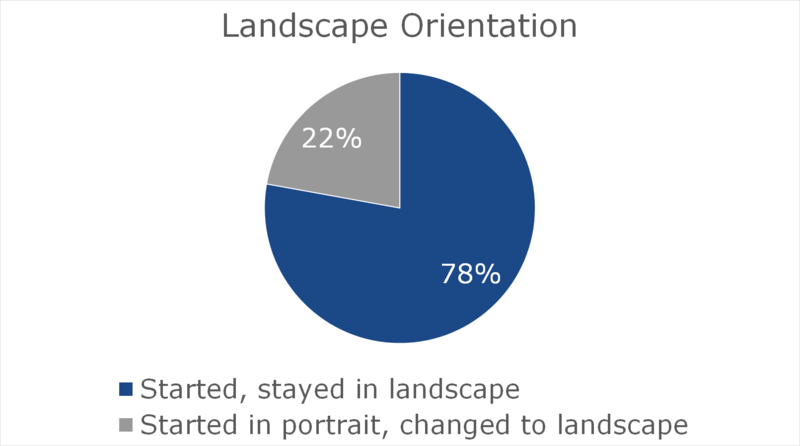 We broke down the 17.5% landscape orientation into two categories: visitors who started in and stayed in landscape, and those that started in portrait, but changed to landscape. 78% of users anticipated the video content and already were in landscape. 22% flipped their phones and shifted from portrait to landscape. The median time that flippers took was 28.7 seconds. This gives designers a sense that it takes a while to recognize and react for the transition to landscape. Does size of phone or tablet make a difference for portrait vs. landscape orientation? Yes, the larger the device, the more likely it is to be initially held in landscape orientation. We refreshed our previous data that looked how display size and orientation (below). Tablets are held in landscape on average 44% of the time while browsing video sites. This figure is more than twice that of smartphones. This figure is impacted by a fair number of tablets coming from the mini or reader form factor that has a display 7-8 inches diagonal. In contrast, larger tablets with 10-11 inch display are watching videos in landscape 71% of the time. In summary, video producers should take into account where their video will be consumed, the content included in the video, and whether orientation will impact its effectiveness. Thanks to Corinne Podger for her insights and commentary on this study.